On tonight's episode of Bar Rescue, Jon Taffer and crew are in Pahrump, Nevada to try to rescue Paddy's Pub. Paddy's Pub is owned by Pat Rodgers and her son Russ who bought the bar in 2006. Pat recently gave Russ more control over the bar and things have gone downhill since and Russ has had to borrow some money to keep the bar open. Russ is 18 months into his ownership and has supposedly taken well over $100,000 in debt. Paddy's Pub is supposedly in danger of closing in as short as a month. "Nice fun little dive bar. The drinks are good, the bartenders are awesome!....I was happy with the service from all bartenders, for being in a small town this bar was amazing not because of the small town but the service was great and the prices were spot on good price for a bar....The setup of this bar is nice and it's such a huge bar. If I ever visit pahrump again I'll definitely visit this bar again. Good spot to come and enjoy drinks, socialize. My group enjoyed our night spent here and again I reiterate the workers there were so friendly and great service. Definitely recommend this bar." "Happened to stop in this past Saturday and it was just a bar that has been remodeled. Bartender and server were okay but not very friendly. Prices were a bit higher for Pahrump but not that bad...Overall an average bar .... nothing I would go back for." "Won't give you a corona while you gamble. The remodel looks nicer but the owner is cheap." The Bar Rescue makeover happened in January 2017. Here is the Paddy's Pub/Oasis Facebook Page and there is no website. When Bar Rescue was filming in January, people on Facebook were discussing how the bar always had a younger crowd and a lot of fights. Here is another discussion saying there were always drugs and fights there. Also, some Yelp reviews seem to say the same thing as they talk about fights at the bar. In an article shortly after the makeover, Russ said people were impressed with the new look, but a few regulars felt change wasn't needed. He also said the bar was going for a different demographic and a slightly older crowd. Russ also said he was pleased with the remodel. A June 2017 article said that the bar now goes by the name of Oasis Bar (Pictured right). Russ said Pat's Courtyard Bar was a little vanilla and Oasis has "brand new gaming, a DJ five nights a week, billiards, beer pong and dartboards, along with additional amenities." He also decided to install a dance floor. He said they are still offering the six sandwiches introduced by Vic Vegas. Pat's Courtyard Bar did not keep the name given to them by Bar Rescue. 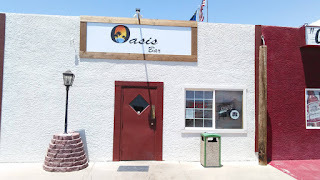 They first went back to the name Paddy's Pub, but they have recently changed the name again to Oasis Bar. There aren't too many reviews of the bar, but it seems that Bar Rescue tried to bring in an older demographic. With Oasis having a DJ five nights a week, billiards, beer pong, dartboards, and a new dance floor, it seems that Russ is catering to a younger crowd again. One thing that did stick at the bar is the sandwiches introduced by Vic Vegas and they are still being served. UPDATE - Oasis/Pat's Courtyard Bar closed around September 2017. Here is a Facebook thread of an employee that confirmed they closed (Link).